Smiles and adventures in writing. 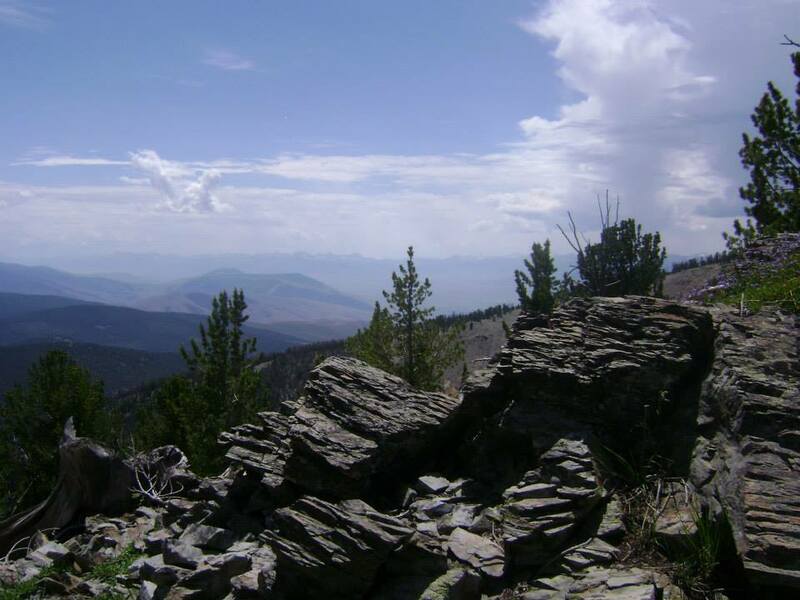 Ah – Beaverhead – This course is unforgettable, breathtaking and full of surprises! Last year this race nearly killed me, physically and spiritually. My friend Nellie and I rolled into the last aid station well after dark. I was angry and bonking and wanted to quit. I had suffered from IT band issues for miles and the descent was proving to be brutal. I called my husband and told him I was quitting to his reply of “You only have 5 miles – everyone is waiting for you.” So I finished the race,at 2 am, defeated. Then, of course, signed up again, determined I could finish stronger. This year I was more prepared with having been on the course before. I knew my head could be my biggest friend and having a pre-race pep talk by Travis Macy, the author of “Ultra Mindset” solidified that knowledge. It was a surprise and a treat to listen to him talk! I started the day with a detailed plan – a new strategy for me. I knew how long I had between each aid station to finish before 10:30 pm – a stretch goal of taking almost 3 hours off my previous time. I also had learned that my recurring injuries rear their ugly heads when I am dehydrated so I really focused on drinking a lot of water and eating every 45 minutes. Those 3 strategies, combined with better weather held big promises for reaching my goal. The day started at Lemhi pass with lots of friends! We were bused up to the start at 8358 feet! After bathroom breaks, and getting race numbers we all took turns taking pictures of each other at the start then patiently waited to begin. At 7 am the race started! Immediately, the trail ascends a very steep hill climb for about a half mile. It’s here that the different paces spread out. 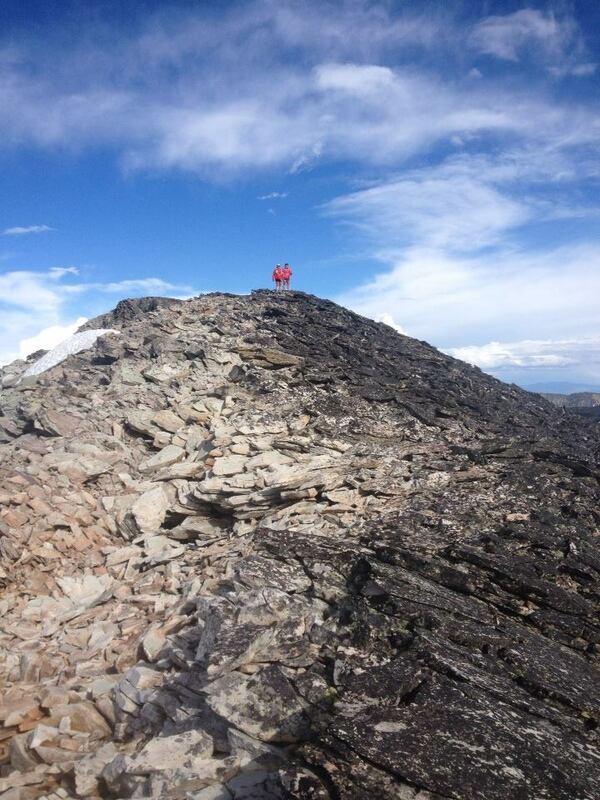 I quickly found myself where I should be and was able to relax and enjoy the climb. 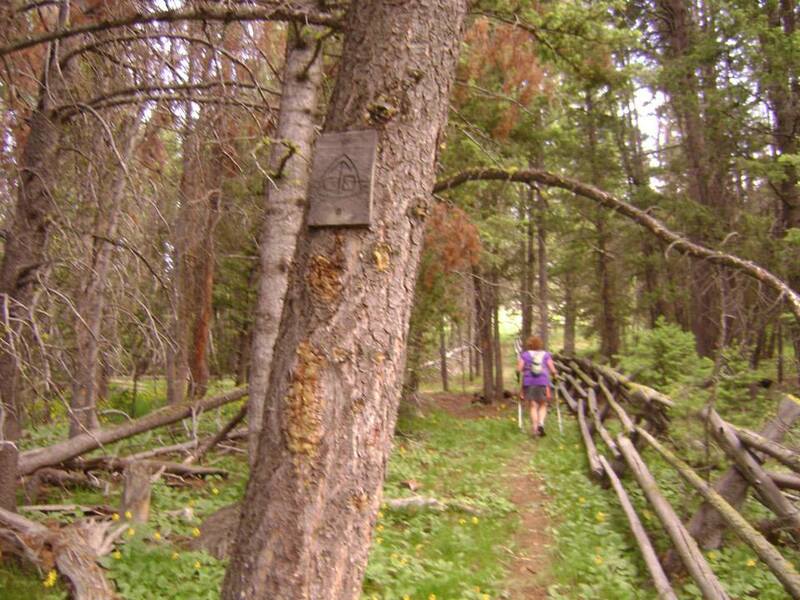 For the next 18 miles – the course follows the Continental Divide Trail. For about 16 miles of that it is mostly nice, rolling single and double track through the trees. Simply amazing! We made good time and put lots of it in the bank for the skree field later in the race. Pictures from last year’s race! I was feeling pretty good through most of this part and we were keeping on pace. I started to get tired around mile 10 so I ate some sport beans. I suddenly was craving candy like crazy!! I don’t usually eat a lot of sugar so this was very odd for me. I decided to go with it and it seemed to work. At the 2nd aid station they had swedish fish and mike and ike’s. Along with my regular nut butter and potato chips, the super sugary candy fueled my entire run. I’ve learned over the few ultra’s I have completed that while it is not smart to try something brand new on race day, I do better when I eat what I crave as this is probably an indication for something I’m lacking. 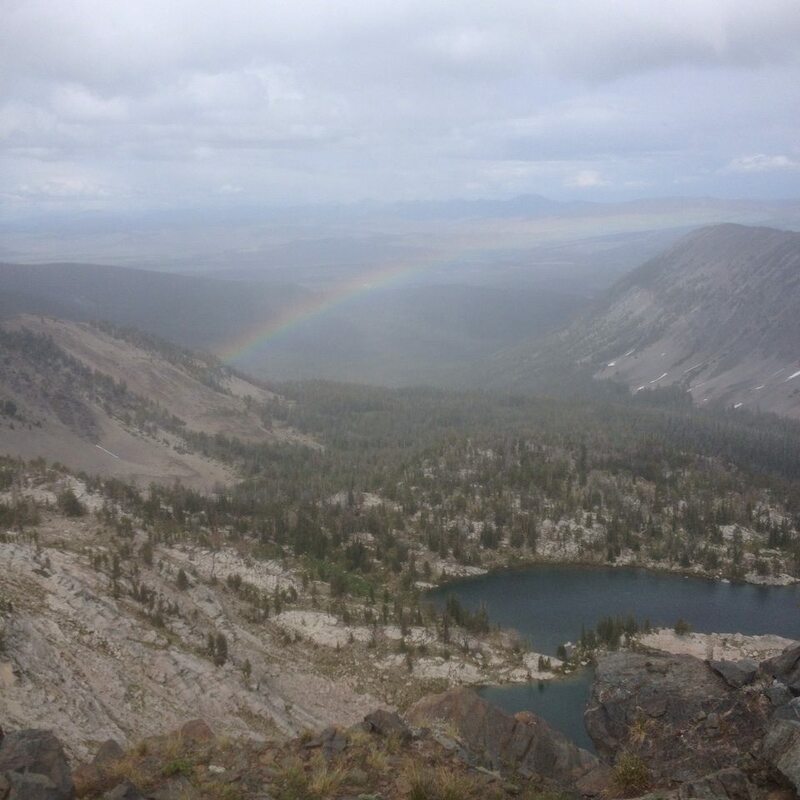 Around mile 15 – 16 the trail started opening up and we were treated to gorgeous views! It is also here that the trail starts to change and we began to see a lot more rock. We stopped to check out the views a few more times but we had a big goal this year!! So lots less time for pictures! Eventually, we made it into the Gold Stone aid station. The volunteers were so welcoming! 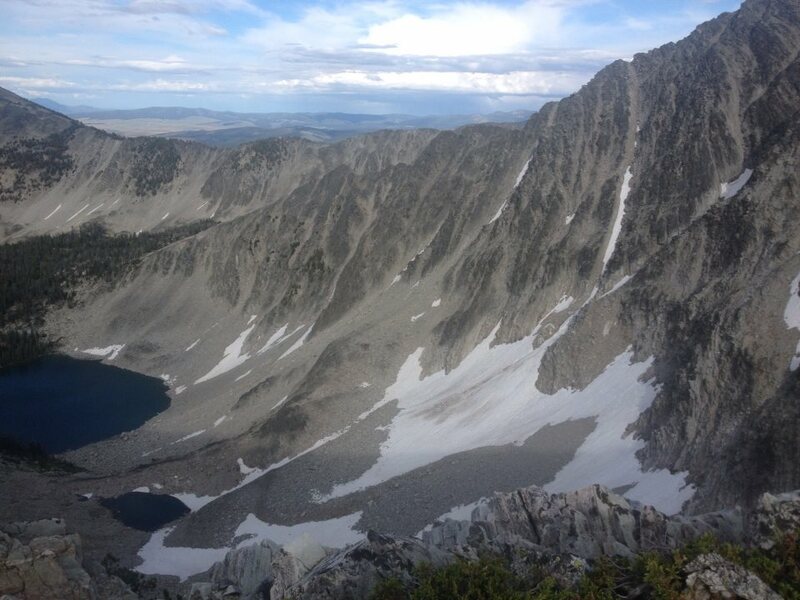 They filled us up and we were on our way – 2 hours earlier than we had been at that aid station the year before. It was amazing to be that far in a race and not here one word uttered from a volunteer about a cutoff! Next up was the Janke Lake aid station! Again, the most wonderful volunteers! One of them treated some blisters on Nellie’s feet while we ate her homemade snacks. It was so friendly and amazing! Finally, we headed out to the toughest 6 miles of the course. These 6 miles are what make this race different from every other race I’ve participated in. We start out with an intense climb – the one you see in the picture above. 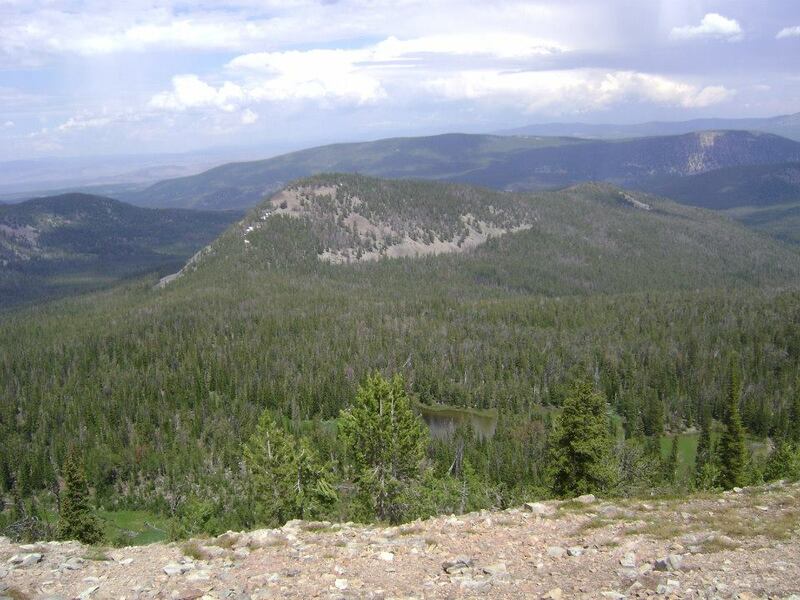 We climb to the top of that point and then quickly begin navigating a 3 plus mile skree field topping out at 10,047 feet. Nellie and Stephanie, coming down the skree field. At this point we had several people starting to pass us from the 100k (I’ve never considered myself fast) Each of them commented on how tough the skree field was and no one was running. 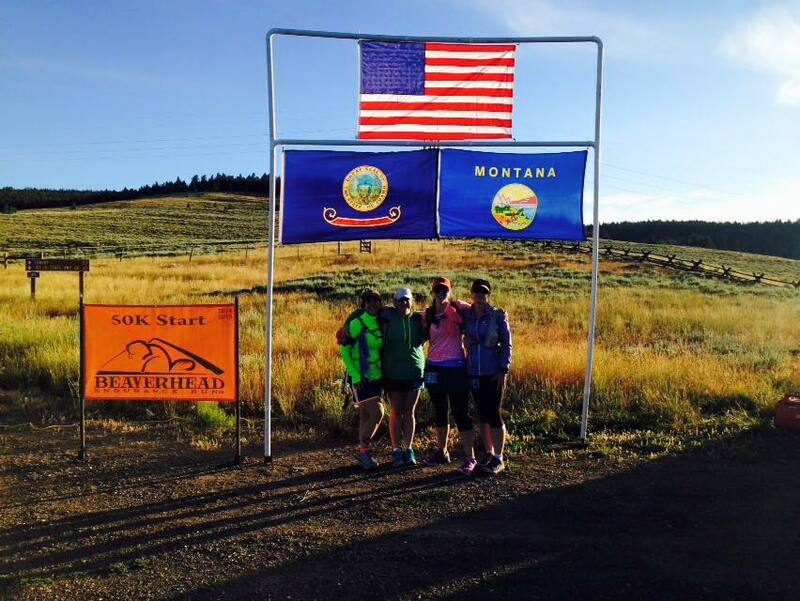 The skree field follows the Continental Divide – one side is Montana and one side is Idaho. It’s absolutely breathtaking,terrifying and excruciatingly slow! Soon, we came to the section where we start to descend and we saw a trail again. It was a fantastic sight although this year, I was a little saddened to leave those brutal 3 miles. 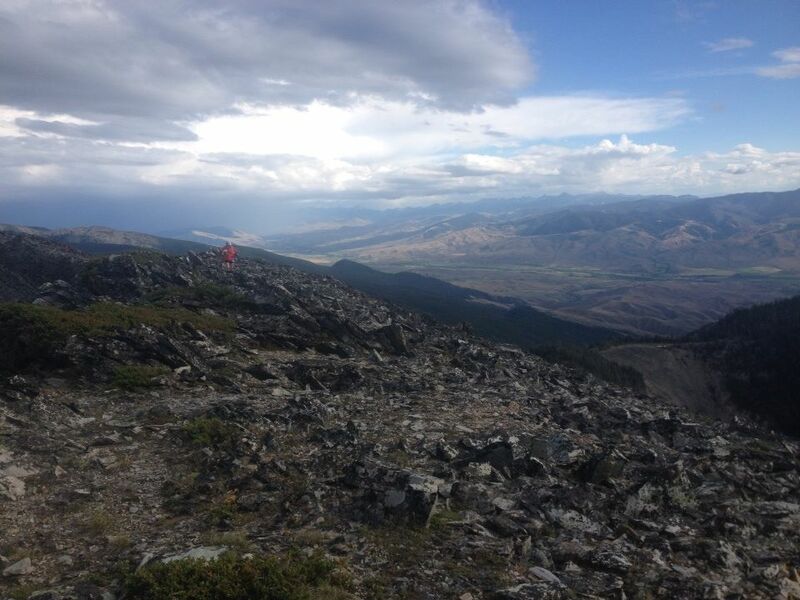 In the next 3 miles, the course follows a steep game trail that loses 4000 feet!! 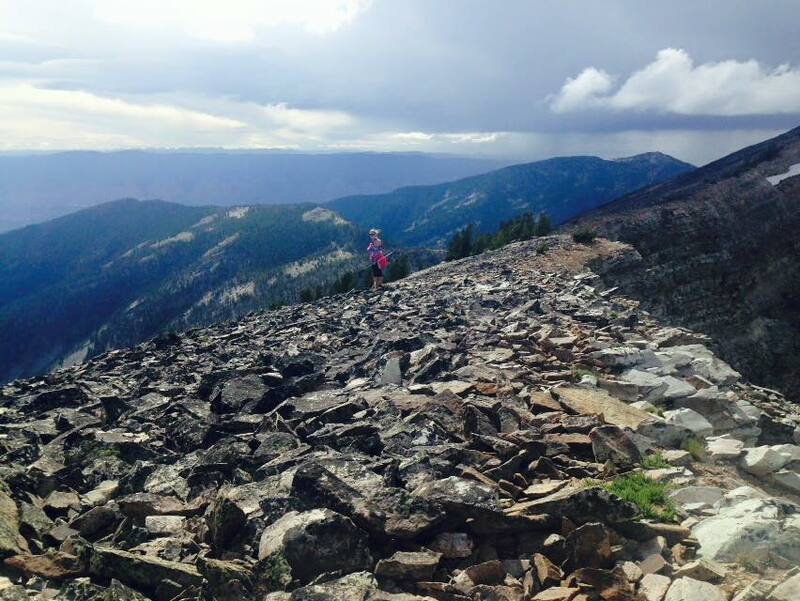 It’s insanely tough after already running 26 miles at a high elevation and on a rocky course! It’s tricky and this is where I suffered immensely with IT band problems the previous year, making this part of the course even tougher. This year I had no problems and although it was slow going, I was happy to complete the steep downhill in the light! 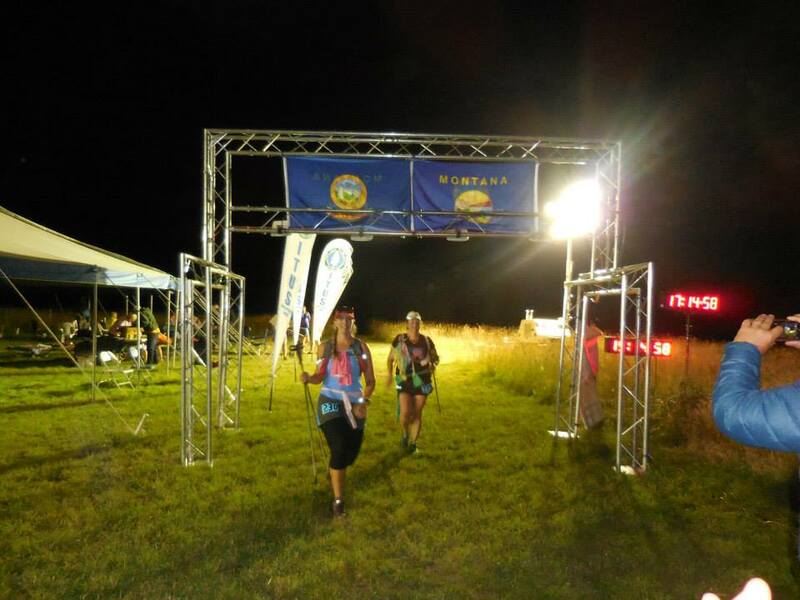 When we made it to Bohannon Creek Aid Station this year, I rolled in with a huge smile on my face, announcing, “I am SO HAPPY!!! 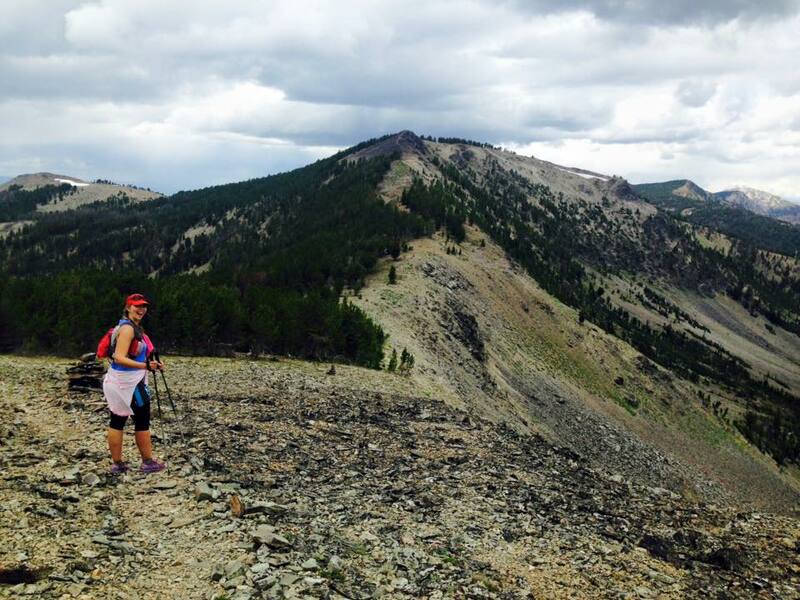 !” The last year I had been grumpy and in pain and I knew these poor aid station workers had to deal with a lot of the same since they were the ones greeting runners after that brutal 6 miles. I laughed and joked as I was treated to a delicious smoothie and more candy!! Then I called my husband to tell him where I was at. He was so happy to hear we were 2 1/2 hours ahead of our time the previous year and even said, “Wow! You sound great!” I replied that I felt great and was going to finish in the daylight. This phone conversation was the highlight of my race. The reason I do these things is to prove to myself over and over that I am growing and learning. Knowing where I was last year compared to this year fills my heart! We left the aid station and made our way to the finish. It’s still very rocky and downhill so it wasn’t super speedy but I was just enjoying the daylight and the scenery I had missed the previous year. I even ran although the pace tended to be the same as walking. We finally reached the finish, just after the sun had fully set, around 10:15pm. I excitedly crossed the finish line and exclaimed to the race directors that we had taken 4 hours off our time!! One of them high-fived me and the other said “I know, I know! !” It turned out later to be just under 3 hours but I had been to depressed about the time previously to look at the official results. Overall, I couldn’t be happier. Nellie and I worked really hard to keep up with the aid station splits I had figured out and to keep ourselves taken care of before any issue got out of hand. Over the last year I’ve really focused on speed work, powerful movements and focused weight training through Cross-fit to enhance my performance in mountain running. I’ll never win any races but I’m just a happy girl to be in the mountains, with great company, incredible scenery and a drive to consistently and persistently improve myself. 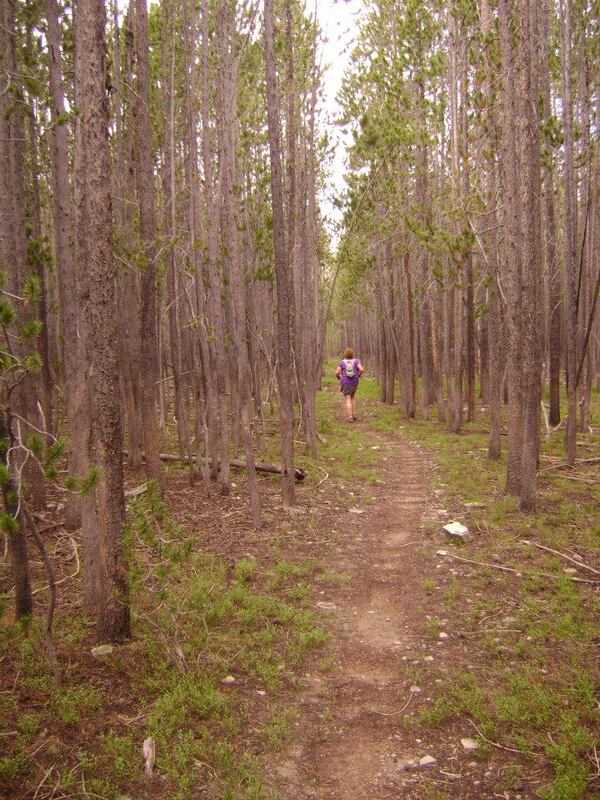 It was a blast seeing Boise Trail Runners on the course as last year Nellie and i were the only ones. I really got a lift each time I saw one of them on the trail. I don’t think there is a kinder, more fun group of runners out there! All this combined with cooler weather and I made the goal I set out for myself! Eric and David Tarkleson are fantastic race directors. I highly recommend this race!